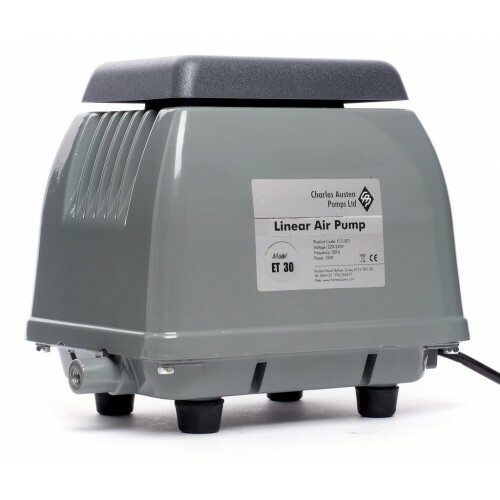 The Charles Austen ET series linear diaphragm air pumps provide a clean oil free air source, which is exceptionally quiet in operation and vibration free. Suitable for continuous duty they are ideal for applications where reliability is essential. Unique silent running design designed with a unique vacuum assisted noise reduction system these pumps are almost silent running with operation as low as 35dB. A range of models are available offering flow rates in steps from 30 - 60 Litres Per Min. Ease of use - Housed in portable weatherproof compact casing the ET series offers simple plug and run operation. Virtually no maintenance is required apart from a simple filter change which is tool free.